Jerry: The only reason there’s anybody here is because there’s nowhere else to go. How can someone who has built a reputation for being one of the more imaginative and visually creative directors in modern cinema find himself producing work that feels increasingly limited in scope? French filmmaker, Michel Gondry, broke out of the music video milieu in 2004 with ETERNAL SUNSHINE OF THE SPOTLESS MIND. The mind-melting dive into a psyche burnt by love was a dizzying assault on the eyes and a cerebral tickle simultaneously. His narrative film follow-up, THE SCIENCE OF SLEEP (2006), was expected to be a similar experience revolving around the dreamiest of human experiences. While it may have been whimsical, it lacked the firm contemplative nature of its predecessor. This was of course forgiven considering the elusive nature of the subject but disappointment was still felt. 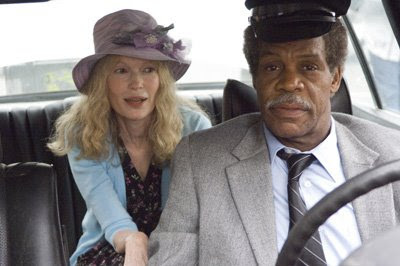 Now, as if in direct response to his criticisms of being perhaps too imaginative to be always understood, Gondry has crafted BE KIND, REWIND, where the madness of Gondry falls from the boundless sky and hits the pavement of Passaic, New Jersey, hard. His once ingenious approach is not entirely squashed but rather squeezed into conventional form resulting in a work that tries too hard on all plains. The beginning of BE KIND, REWIND is both bizarre and boring. 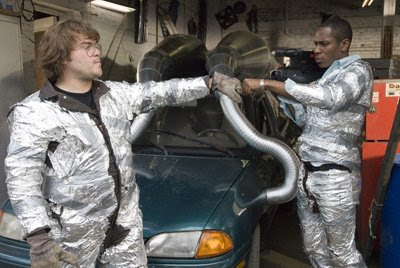 A video store clerk (Mos Def), his boss and mentor (Danny Glover) and a junkyard mechanic (Jack Black) sit around with colanders on their heads and stare across the street at a supposedly pimped out ride (an economy car outfitted with gigantic aluminum piping that looks like a musical wind instrument out of the world of Dr. Seuss) as they blabber on about working in a microwave or something equally nonsensical. Gondry just drops us there. He explains nothing as if everything we see is supposed to already make sense. Apparently, it means nothing to Gondry that we are not permanent residents in his brain. By the time Black’s Jerry concocts some plan about sabotaging the neighboring power plant with a grappling hook that I can only assume he found in the junkyard, I was ready to walk. Gondry’s attempt to ground the imagination in a real context only served to show how the two worlds are separate for a reason. Naturally, the sabotage is a disaster and this leads to every videotape in the “Be Kind, Rewind” store being erased by magnetism. Def’s Mike must now replace the tapes before his father figure finds him out and he proves to be the disappointment he fears he truly is. Thankfully, hilarity finally ensues. Jerry and Mike proceed to reshoot “classic” fare like GHOSTBUSTERS, RUSH HOUR 2 and DRIVING MISS DAISY to replenish the shelves of wasted tapes. As they parade around in costumes made of aluminum foil and Christmas garland, they remove every trace of quality from these conventional crowd pleasers. Their antics and approaches are goofy and very funny in an intimate fashion; the chemistry between the pompous Black and the timid Def is just what the film needs to get the audience laughing and rooting for its formerly uninteresting heroes. And while they may look to be ruining these films at first, what they are really doing is reminding the audience that movies needn’t be made for millions of dollars to be entertaining. Suddenly, there is a lot being said in BE KIND, REWIND. The neighborhood that is home to the store is being entirely remodeled and Glover’s Mr. Fletcher wants to transition from VHS to DVD in order to compete with the chain stores that are gobbling up small business. The nostalgia for simpler times points out how glossing everything over to look new doesn’t erase what is underneath. Despite this, Gondry is too busy glossing his own work over to solidly make his point. 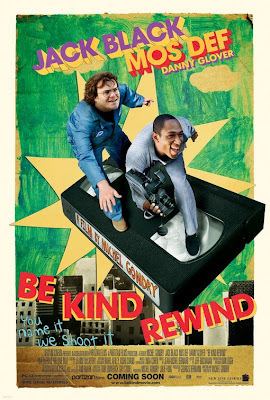 When BE KIND, REWIND is funny, it’s hysterical. When it is not, it is awkward and annoying. Though the film praises the amateur filmmaker in all of us, this is no excuse for it to play out like it was actually made by an amateur. Still, the film fosters a strong community effort to work together and be a part of movie making magic – a world so many of us admire regularly from afar but so few comparatively get to be involved in. The little guy can have his voice too and push his imagination further than, well, he ever imagined. Unfortunately, Gondry makes a crucial mistake and forgets to ask the audience to join in all the fun.